The products you can buy online or from high street shops often fail to declare the precise chemicals used so it’s very difficult to assess their safety. Because of this they should not be considered safe. What problems can you experience when using DIY teeth whitening kits? If you use too much bleach it can cause extreme tooth sensitivity, and possibly damage to the nerve. If you have active periodontal disease you may notice that your gums shrink. If you have deep cavities, the bleach can have a direct route to the blood vessels and nerves, causing toothache. Before considering DIY teeth whitening speak to your dentist as they have a range of easy teeth whitening solutions available. 1. Whitening Strips are mouldable plastic strips containing the optimum amount of whitening gel, which simply, safely, and effectively whitens your teeth. With a unique gentle whitening formula that helps to limit tooth sensitivity, these enamel-safe professional whitening strips are designed to follow the contour of your teeth, enabling you to safely and comfortably achieve whiter teeth by applying the strips for 60+ minutes once a day for 14 days. 2 Professional whitening gel delivered in prefilled, disposable trays, Opalescence Go features the enhanced UltraFit™ tray and can deliver dramatic results in as a little as 15 minutes per day. 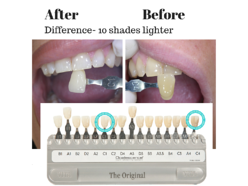 The UltraFit tray sets Opalescence Go apart with its unique material that warms with the temperature of the body so that it comfortably moulds and adapts to any patient’s smile​ for an even more effective and enjoyable whitening experience. With no impressions, models, or lab time required, Opalescence Go is the professional alternative to less-effective over-the-counter options and is an excellent introduction to whitening as well as a perfect follow-up to in-office whitening. The dentist will make a mould of your teeth and then provide you with the whitening material. It is essential that you get this material from the dentist, as too high a concentration will damage your teeth. It is illegal to get bleaching materials from anywhere else except a licensed dentist including beauty salons. You then need to sleep with the mould for 2 weeks or until you have the desired result.This is an easy teeth whitening that works. Patient are happy when their teeth is 10-12 shades lighter. With prices ranging from £38.50 to £575 your dental practice have a teeth whitening treatment affordable for you.